Authors: Ramesh K Sen , Lokesh Jha . Fractures of the pelvis or acetabulum concomitantly occurring with a femur fracture irrespective of their location constitute the term floating hip. These represent a wide spectrum of injury patterns which require surgical intervention. These fractures are a result of high velocity trauma secondary to road traffic accidents or fall from height. Various combinations and fracture patterns are described in the wide spectrum of floating hips. Management of these cases proceed in line with the principles of damage control orthopaedics. Fixation of unstable pelvic fractures is equivocally done with external fixators when indicated. Further guidelines with respect to the sequence of fixation of these fractures are lacking. We recommend fixation of unstable pelvic fractures with external fixator and adequate resuscitation in accordance with principles of damage control orthopaedics. Following this, preference is given to dislocation of the hip or fractures of neck of femur which endanger viability of the head of femur. The fixation of femur comes next in priority and the rest including fractures of acetabulum, sacrum, SI joint can be fixed at a later date. Floating hips have been classified as per Liebergall into groups A and B (5). Group A included femoral fractures with an ipsilateral unstable vertical shear or open book pelvic fracture [Fig 1]. In Group B fractures of the acetabulum were concomitantly present with a femur fracture. Technically only the latter would classify as a floating hip [Fig. 2]. Mueller classified floating hips into 3 types (4). Type A, a combination of acetabular and femoral fractures, type B combination of pelvic and femoral fractures, while type C was a combination of fractures of acetabulum pelvis and femur. While the above 2 classification were based on the location of the fractures, later in 2002, in another article Liebergall proposed two types of injury and correlated it with its mechanism of action (3). The first is a posterior type injury: a posterior type acetabular fracture with ipsilateral diaphyseal femoral fracture. This was said to be a consequence of Dashboard injury where there was a direct blow to the knee. The force was transmitted from the femur to the posterior elements of acetabulum as the hip was in a flexed position. This caused a posterior wall or a transverse with posterior wall fracture of the acetabulum. For this combination to occur the acetabular fracture must have preceded the femur fracture following which there was still persistent force to cause bending forces in the diaphysis and cause a short oblique or a transverse fracture. These fracture patterns can also be associated with ligamentous derangement of the knee (tear in PCL) and or patella fracture with or without knee effusion (3). The second type was the central type wherein there was a central type acetabular fracture and an ipsilateral proximal femoral fracture. The central fracture dislocation is an old eponym to describe the inward protrusion of femoral head into the pelvis which occurs unceasingly due to a bi-columnar fracture or displaced anterior and transverse fractures without posterior involvement. This pattern of injury was found in patients who have a history of fall and among pedestrians struck by a moving four-wheeler. Here the impact of injury was the lateral aspect of the greater trochanter and the transfer of force was to the hip joint which was transmitted centrally across the hip into the pelvis. The remaining force dissipated to the surrounding structures causing a fracture in the proximal femur if it hadn’t occurred at the time of impact. There were no associated knee injuries in these patients. This suggested mechanism of injury and its subsequent consequences have been disputed by a retrospective study on 57 patients by Burd et al (9). Though data on mechanism of injury were not available in their study, there were no significant correlation between the type of femur fracture and associated acetabular fractures as described by Liebergall (9). Femur fractures are mostly trochanteric or diaphyseal [Fig.2,3] rarely involving the neck of femur while distal femur fractures were not reported in the series of Liebergall (3, 5). He opined that the distal femur absorbs most of the energy because of its proximity to the point of impact and the residual force that is applied to the acetabulum is insufﬁcient to induce a fracture. Despite the mechanism being a Dashboard injury with axial loading forces there is low prevalence of distal femur fractures. Suzuki et al reported four distal femur fractures in a total of 34 cases, while Burd et al in their retrospective study of 57 patients found 18 cases of distal femur fracture (9, 12). Most of the fractures of the femur are closed fractures while open femur fractures were found to occur in 22% of the cases in the study by Wu et al (15). The patterns of acetabular fractures in cases of floating hips mostly are of the posterior wall or transverse fractures or their combination (9). Other elemental and associated fractures are possible and are found to be present sporadically. The natures of these fractures are a result of force transmission along the long axis of the shaft of or along the axis of the femoral neck. The various fracture patterns are possible due to the varying position of the involved limb in terms of rotation and or abduction and adduction of the affected hip. Fractures of the pelvis have not shown a particular trend to be universally applicable to floating hips. If the stable fractures Tile A are to be excluded then most of the fractures are found to be rotationally unstable as compared to both vertically and rotationally unstable (9,15). The commonly found injuries of the pelvis are the lateral compression injuries as described by Suzuki et al and the Tile B type of pelvis fracture as described by Wu et al constituting 65 % and 75%of the total injuries respectively ( 12, 15). Liebergall et al in their study had encountered 17 cases of which 9 were vertical shear while 3 were vertical shear combined with open book type injury (5). As with any case, poly trauma management proceeds in line with ATLS protocol. Patients should be assessed for other associated injuries which may require lifesaving surgeries involving other systems. Embolization should be considered in patients with major pelvic fractures who are haemodynamically unstable, have evidence of pseudo aneurysm or cases where blood pressure does not respond to massive transfusion (16). The time to first definitive surgery irrespective of fixation of femur or acetabulum was found to be 87 hours and 132 hours as shown by Burd et al and Muller et al respectively (9,4). Thus, showing the necessity of adequate resuscitation and adherence to principles of damage control orthopaedics. Early fixation of fracture plays a crucial role in decreasing the chances of neurovascular and pulmonary complications. The controversy arises when we consider the order of fractures to be fixed. There have been mainly two views put forth, Liebergall (5) classically said that the femur fracture fixation should take precedence over acetabular fracture which was also followed by Suzuki et al (12) and suggested by Kregor and Templeman (17), while Muller (4) operated femur first in only 38 per cent of his cases. Immediate stabilization of the pelvic injury in the emergency room as a resuscitation tool was to be followed by fixation of the femur. In cases with a concomitant acetabular fracture Muller et al stated that floating hips do not represent special treatment and can be treated as per existing guidelines for the aforementioned fractures (4). Liebergall stated in his article the hypothetical need for two operating surgical teams taking into consideration the polytrauma presentation of these injuries. He advocated early stabilisation of the femur fracture as per prevailing guidelines and a three to five-day delay for the fixation of acetabular fractures (18). Femur fracture was fixed first followed by fixation of unstable vertical shear injuries. SI joint disruptions were approached via 2 curvilinear incisions. Reduction of the fracture was followed by posterior stabilisation with Harrington sacral compression rods. Sacral ala fractures were reduced and stabilised with interfragmentary compression screws. None of the cases quoted in the study required anterior fixation of pelvic injuries (3). Acetabulum fractures which involved the dome and posterior wall or column were all approached with the same Kocher-Langenbeck approach. There was need for anterior Ilio-femoral approach and a trochanteric osteotomy when fracture lines extended up to the iliac wing or the anterior column. In cases where intramedullary nailing was to be done trochanteric osteotomy was done first followed by nailing and then the acetabulum was reduced and fixed. The surgery concluded with fixation of the trochanteric osteotomy. Earlier fixation of the femur also facilitates easier positioning, preparing and draping of the patient (9). In fractures of the femur involving the diaphysis or the distal third, fixation with plates and distal femur nails are preferred. This is desirable as we can avoid incisions proximally and preserve the anatomy of the area around the acetabulum. Proximal femur fractures can be approached laterally in the supine position on a fracture table and be fixed with a sliding hip screw and blade plates. The fixation of the acetabulum can proceed after transfer to a radiolucent table. If antegrade intramedullary nailing is required, it should be done preferably in the lateral position to incorporate its incision with the Kocher-Langenbeck incision. Either the piriformis or the greater trochanter can be used as the entry point. But the problem occurs while trying to visualise the femoral heads lateral projection to check the direction of the proximal locking blade or screw. The advantage here is that there is no need to change positions for fixation of acetabular fractures. Beginning in the supine position facilitates monitoring of patient vitals and treatment of other abdominal, thoracic and associated injuries in other limbs. Suzuki et al and Wu et al in his paper on this topic fixed unstable pelvic fractures in the emergency room with external fixation (12, 15). Suzuki et al in their paper performed internal fixation of pelvis after femur fixation in 6 patients while in 3 patients pelvis was fixed before femur in the same anaesthesia. In a case with minimally displaced acetabulum fracture they broke their protocol to fix the femur first in fear of displacement of the acetabulum fracture (12). Kregor and Templeman in their paper suggested three different strategies for fixation of floating hips: Fixation of the acetabulum followed by antegrade nailing, or fixation of acetabulum followed by plating of femur, and finally distal femur nailing of femur followed by acetabular fixation. He opined early preference for the acetabular fracture in views of preventing further damage to the hip joint (17). Cases where a concomitant dislocation is present along with the floating hip, authors primarily focussed on the reduction of the dislocated hip [Fig.4] (19, 20). Tiedeken et al in his case opened the hip by the Kocher-Langenbeck approach and the joint was reduced and posterior wall acetabulum plated with reconstruction plates. The patient was then placed in supine position to fix the femur fracture by the retrograde method (19). Duygulu et al in their paper approached the hip by the posterolateral approach and fixed the transverse and posterior wall fractures by reconstruction plates. In this case there was an associated neck of femur fracture along with shaft, a reconstruction nail with a piriformis entry was used. Closed reduction was done of the shaft and the nail driven through. This was followed by the reduction of the femoral head. An external fixation for pubic diastasis was applied (20). In case reports of a concomitant floating hip and knee injury the authors have chosen to fix the tibia first followed by the femur and then finally check the stability of the acetabulum and proceed. Both the long bones were fixed via the same incision (21). Hideto et al in their case report of an ipsilateral femoral neck, shaft and acetabular fractures, the femur shaft was fixed in the same sitting as the neck fracture. The shaft femur fracture was fixed by retrograde nailing and then patient was transferred to a traction table where the neck of femur fracture was fixed with multiple cannulated screws. The acetabulum fracture was operated on seven days after the femur surgery. The transverse acetabulum fracture was approached by the modified Stoppa technique and fixed with reconstruction plate. This was followed by posterior wall fixation by the Kocher-Langenbeck approach (22). In a metaanalysis by Giannoudis et al acetabular fractures were found to have complication rates as described below. Traumatic and Iatrogenic nerve injuries were found to be present in 16.4% and 8 % respectively. Other complications documented were DVT/PE, local infection, heterotopic ossification, and AVN which were found to be present in 4.3%, 4.4%, 5.7% and 5.6%respectively. The most commonly found complication was osteoarthritis of the hip occurring in 19.8% of the cases (23). The rates of complications reported by authors in patients of floating hips vary widely. However there seems to be an increase incidence of complications seen in cases of floating hips when compared to those of isolated acetabular fractures. Leibergall in his study of 17 hips encountered two cases of delayed wound healing. There were three cases of pin tract infection which healed by removal of the fixator. 4 patients had severe pulmonary and or cardiac complication with one requiring a tracheostomy. Serious long term morbidity was present in 10 of the seventeen cases, two of which were iatrogenic sciatic nerve paresis. Other complications included no anatomic acetabular dome, heterotopic association, painful heel, peroneal and femoral paresis and subtalar osteoarthritis. One patient had a reflex sympathetic dystrophy of the foot while one case needed an above knee amputation. 5 patients had shortening up to 2.5 cm of the involved extremity. The shortening was due to comminution in the femoral fracture site in four of these cases, while the remaining one was attributed to the malunion of pelvis (5). Burd et al in their study had documented complications of deep vein thrombosis in seven patients (12%), non-union of the femur in two patients (3%) and avascular necrosis of the femoral head in one patient (2%). Post traumatic osteoarthritis of the involved hip joint was seen in nine patients (16%). Heterotopic ossification (34%) was classified by the Brooker classification where 4 cases were clinically not significant while the remaining 7 cases had lesions of Brooker grade 3 or above. Nineteen of the fifty seven (33%) cases had evidence of Sciatic nerve injury. Seven of these patients had sensory involvement, five had motor involvement while the remaining seven had involvement of both. It was noted that at an average of seven and half months post operatively eight cases had recovered completely four of which were of the sensory type and two each were the motor and combined types respectively. Two other cases showed partial recovery at eleven and half months post operatively while the remaining nine cases showed no improvement till a little above seventeen months of follow up. Trendelenburg gait was found to be present in eight patients (14%) in the post-operative period (9). Mueller in his study had a 35 % occurrence of sciatic nerve injury. The recovery rate established for his sciatic nerve injuries were 25%. There was one case of vascular injury reported (4). In an article by Zamora et al of 11 floating hips acetabular fractures were most commonly associated with diaphyseal fractures. 3 of the cases were supracondylar level fractures and were associated with popliteal artery injury. Despite prompt vascular repair the limbs were not salvable and had to undergo an above knee amputations. In their series, this was the most dreaded complication (24). Floating hips are a wide spectrum of injury patterns which require surgical intervention. Fractures involving the pelvis take preference over any other orthopaedic injury which may be managed according to existing protocols. Cases involving unstable pelvic fractures have been fixed by external fixation equivocally and the resuscitation of the patient takes precedence before definitive fixation. Controversy arises as to how we proceed in view of order of fixation in a case of floating hip. Proponents of earlier fixation of femur suggest factors such as ease of fixation of acetabulum as traction application is easier, easier preparing draping and positioning for acetabular fixation and reduction in risk of fat embolism. In other cases, where retrospective data has been used the order of fixation has been left upon the discretion of the trauma surgeon (12). However, earlier fixation of the acetabulum has been propagated in cases of unstable dislocated hips and irreducible dislocated hips. Antegrade nailing in these cases could compromise later acetabular surgery by distorting and de vascularizing the soft tissue and musculature. Antegrade nailing is also thought to carry risk of avascular necrosis and weakness of the hip abductors as described by Kregor et al (17). Proponents of femur fixation first also had to abandon their protocol in fear of gross displacement of the acetabular fractures in undisplaced cases (12). The surgical order in management of floating hips has been up for debate. No definitive guidelines are available for the order of fixation of these fractures. This is our attempt to give a structured approach for the management if floating hips. Unstable Fractures of pelvis are mostly of the lateral compression type of Young Burgess Classification or type B type of the Tiles classification which can be fixed by the use of external fixation preferably in the emergency room. Our focus now shifts to the hip joint, to ascertain it is reduced or not. In cases of irreducible dislocated hips open reduction is recommended before fixation of femur. In cases of central type of floating hip the femur can be fixed first either by means of distal femur nail or distal femur locking plate. This will facilitate traction and aid in fixation of acetabulum and other pelvic fractures later on. For fractures of the proximal femur antegrade nailing or dynamic hip screw as ascertained by the fracture type are preferred. The incision of antegrade nailing can be incorporated into the Kocher- Langenbach approach if such an approach is desired. Neck of femur fractures are to be given priority of fixation before fixing fractures of the femur or at the same sitting. The acetabular and other fractures of the pelvis like sacrum fractures, SI joint disruptions can be fixed at a later stage. 1. Agarwal A, Chadha M. Floating injuries: a review of the literature and proposal for a universal classification. Acta Orthop Belg. 2004; 70: 509–14.1. Agarwal A, Chadha M. Floating injuries: a review of the literature and proposal for a universal classification. Acta Orthop Belg. 2004; 70: 509–14.2. Simpson NS, Jupiter JB. Complex fracture patterns of the upper extremity. Clin Orthop Relat Res. 1995; 318: 43–53.3. Liebergall M, Mosheiff R, Safran O, Peyser A, Segal D. The floating hip injury: patterns of injury. Injury. 2002; 33: 717–22.4. Muller EJ, Siebenrock K, Ekkernkamp A, Ganz R, Muhr G. Ipsilateral fractures of the pelvis and the femur–floating hip? A retrospective analysis of 42 cases. Arch Orthop Trauma Surg. 1999; 119: 179–82.5. Liebergall M, Lowe J, Whitelaw GP, Wetzler MJ, Segal D. The floating hip. Ipsilateral pelvic and femoral fractures. J Bone Joint Surg Br. 1992; 74: 93–100.6. Wiltberger BR, Mitchell CL, Hedrick DW. Fracture of the femoral shaft complicated by hip dislocation—a method of treatment. J Bone Joint Surg Am 1948; 30A: 225–28. 7. Chi-Chuan W, Chun-Hsuing S, Lih-Huei C. Femoral shaft fractures complicated by fracture-dislocations of the ipsilateral hip. J Trauma 1993; 34: 70–5.8. Helal B, Skevis X. Unrecognized dislocation of the hip in fractures of the femoral shaft. J Bone Joint Surg Br 1967; 49B: 296–300.9. Burd T, Hughes M, Anglen J. The ﬂoating hip: complications and outcomes. J Trauma 2008; 64: 442–8. 10. Zamora-Navas P, Guerado E. Vascular complications in ﬂoating hip. Hip Int. 2010; 20: S11–8. 11. Iotov A, Tzachev N, Enchev D, Baltov A. Operative treatment of the ﬂoating hip. J Bone Joint Surg Br 2006; 88-B(Supp I): 160. 12. Suzuki T, Shindo M, Soma K. The ﬂoating hip injury: which should we ﬁx ﬁrst? Eur J Orthop Surg Traumatol 2006; 16: 214–813. Willett K, Al‑Khateeb H, Kotnis R, Bouamra O, Lecky F. Risk of mortality: The relationship with associated injuries and fracture treatment methods in patients with unilateral or bilateral femoral shaft fracture. J Trauma 2010; 69: 405‑1014. GiordanoI V, Amaral NP, Rios H,Franklin CE, Pallottino A. Management of ipsilateral fractures of the femur and pelvis (floating hip): a prospective study on 16 cases Rev bras ortop. 2007; 42: 9 15. Wu CL, Tseng IC, Huang JW, Yu YH, Su CY, Wu CC. Unstable pelvic fractures associated with Femoral shaft fractures: a retrospective analysis. Biomed J. 2013; 36(2): 77-83.16. Panetta T, Sclafani SJ, Goldstein AS, Phillips TF, Shaftan GW. Percutaneous transcatheter embolization for massive bleeding from pelvic fractures. J Trauma 1985; 25: 1021- 917. Kregor PJ, Templeman D Associated injuries complicating the management of acetabular fractures. Orthop Clin North Am 2002; 33: 73–9518. Tile M. Fractures of pelvis and acetabulum.2nd ed. Williams, Baltimore 1995 [ chapter 19]19. Tiedeken NC, Saldanha V, Handal J, Raphael J. The irreducible floating hip: a unique presentation of a rare injury. J Surg Case Rep. 2013 Oct; 2013(10):20. 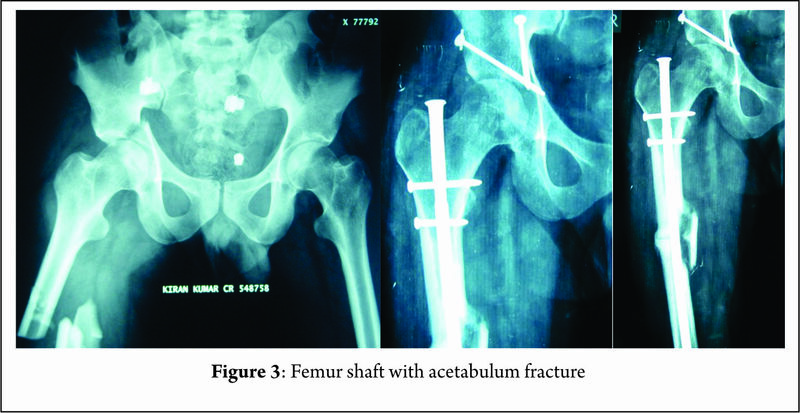 Duygulu F, Calis M, Argun M, Guney A.Unusual Combination of Femoral Head Dislocation Associated Acetabular Fracture With Ipsilateral Neck and Shaft Fractures: A Case Rreport. J Trauma. 2006;61:1545–154821. Yashavantha C, Nalini K B, Nagaraj P, Jawal A. Ipsilateral Floating Hip and Floating Knee – A Rare Entity Journal of Orthopaedic Case Reports 2013 July-Sep;3(3): 3-622. Irifune H, Hirayama S, Takagi N, Narimatsu E. Ipsilateral Acetabular and Femoral Neck and shaft fractures. Case Rep Ortop. 2015; 2015 : 35146523. Giannoudis PV, Grotz MR, Papakostidis C, DInopoulus H. Operative treatment of displaced fractures of the acetabulum. A metaanalysis. J. Bone Joint Surg Br. 2005 Jan; 87(1): 2 -9 24. Zamora -Navas P, Guerado E. Vascular complications in floating hip.Hip Int. 2010;20 7:S11-8. How to Cite this article: Sen R, Jha L.Floating Hip. Journal of Clinical Orthopaedics Jan – June 2017; 2(1):43-48.